One of the many great things about this blog (besides the excuse to pack my freezer with ice cream), is making a home for the friends of ice cream. Whether you have ice cream everyday, or just enjoy a scoop of vanilla now and then, all are welcome. Well, I got an email from a fan...who just so happens to run an Ice Cream of the month club. The funny thing is, it never even dawned on me that their might be an ice cream of the month club. I was intrigued, how could I not be...and then he asked if I would like to start reviewing their selections. Can you guess how long it took me to say yes? I believe it was about 37 milliseconds. Today, a week before the blog's 1 year anniversary, I received my first shipment. Mmmmm, a box full of 4 premium ice cream samples. Oh I'm excited. I mean, really, what does $50 worth of ice cream look like? It's gotta be good...not just good...REAL good to justify the cost. Oh...I'm setting myself up for disappointment aren't I? Ok, 4 choices: I'm going with the Oberweis Ice Cream Parlor Super Premium Ice Cream. Whoa, that's quite the self title they got going there. According to their website: "Oberweis Ice Cream is made with a minimum of 18% Butterfat making it a much richer product than many of the so-called super premium national brands. 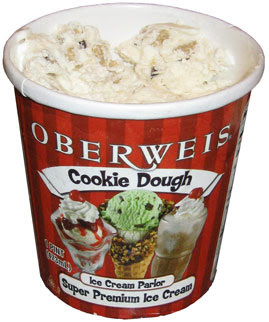 Oberweis Dairy mixes fresh milk and cream along with sugar and other dry ingredients prior to pasteurizing the mix. We then chill and agitate the mix for 24 hours to insure the creamy texture for which Oberweis Ice Cream is famous." Ok, we need a taste test to figure out what this really means. Lid is off and we're going in: First bite and it pretty much tastes like ice cream. Hmmmm, time to enjoy a bowl in front of the TV. Hmmm, ok, now the butterfat thing is hitting me...you know, the one that gives it a buttery flavor. Actually, it reminds me of blue bunny cookie dough, but I'm still not sure I'm describing it right. I tried a couple of cookie dough chunks and they're good. They remind of those days gone by where we'd dig into a fresh roll of Pillsbury cookie dough. Still going...still trying to place the texture. You know what? This ice cream is awesome. There really is a smooth and "famously" creamy texture here. The more I eat, the more I realize I'm really enjoying this. It's different, very different, nothing like I've had before. It's like eating cookie dough flavored whip cream. I was a little worried at first since I set the bar so high in my mind, but this unique ice cream has totally won me over. Disclaimer: Amazing clubs has not paid for a positive review. You're really addicted to ice-cream!